Sightings of basking sharks off Scotland's west coast have increased, according to the Hebridean Whale and Dolphin Trust (HWDT). The results of the organisation's latest research survey includes 32 encounters with the massive fish. 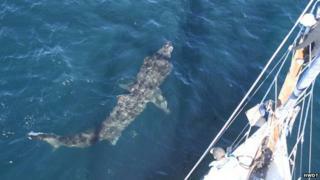 Fifty sharks were counted over just nine days in June during the trust's annual study. Up until 19 years ago, basking sharks were hunted in the seas off Scotland for their liver oil. They are the world's second biggest fish - behind only the whale shark - and can grow to 11m (36ft) and weigh up to seven tonnes. Basking sharks have no teeth and feed on microscopic plankton by opening wide their huge mouths. Every summer the sharks gather in large numbers around small islands off Scotland's west coast, where they are sought out by scientists and wildlife watchers. The survey also recorded 321 encounters with harbour porpoise, 34 of minke whale, 32 of basking shark, 22 of common dolphin and six of white-beaked dolphin. The trust said: "A major encounter - in August near the Isle of Skye - was a rare sighting of three members of a group of killer whales known as the West Coast Community. "This very small group consisting of just five males and four females is thought to be the UK's only known resident group, but, as no calves have been seen within the group, it is likely to go extinct in our lifetime." The surveys are conducted from the research vessel, Silurian.